Stainless Steel Brake Lines come in lengths from 6" to 24" usually ready to ship. Hoses come Stainless Steel or Stainless with Clear Coat, Red, Black or Blue plastic coating. The ends provided come Male VW, Female VW or -3 . 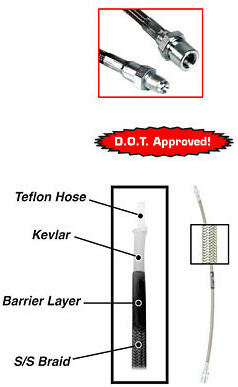 (you will need to choose) Sometimes these hoses will take an extra day to be made if they are not in stock. Custom lengths also available most any size by phone (951) 781-0452 Click more info to choose yours.